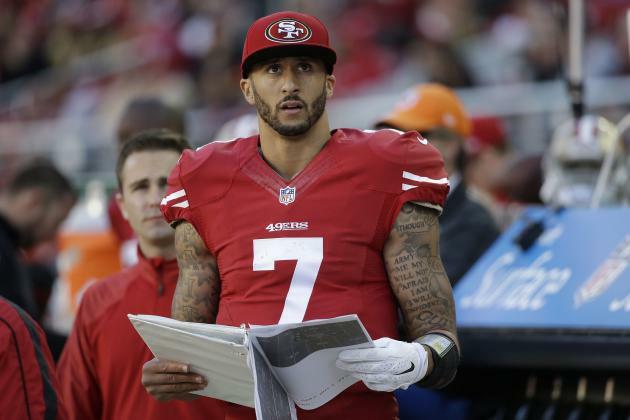 Four weeks have passed and where is Colin Kaepernick? This is the question that San Francisco 49ers fans and NFL fans alike have been asking in the first four weeks of the NFL season. Just three years removed from being in the Super Bowl, the San Fran QB just looks lost on the field. Last Sunday, the Niners were destroyed by the Arizona Cardinals, 47-7. The saddest part about it is that the 49ers quarterback threw more touchdowns for the opposing team than his own. Kaepernick threw a total of four interceptions with two of them being returned for touchdowns. The two pick-six’s came within the first six minutes of the first quarter. The Milwaukee native finished the Week 3 matchup with only 67 yards, no passing TDs, one rushing TD, a 47.4 completion rate and a humiliating quarterback rating of 16.7. Let’s not forget, Kaepernick was the talk of the town just a few years ago. Since taking over for Alex Smith in Week 10 of the 2012 season, the 49ers have been Kaepernick’s team. He led his team to postseason wins over the Green Bay Packers and the Atlanta Falcons before falling to the Baltimore Ravens in Super Bowl XLVII. For 2012 to be Kaepernick’s first year starting in an NFL game, his performance that season was not half bad, which the numbers prove. Colin Kaepernick and the 49ers made it back to the playoffs in 2013 after having an outstanding 12-4 regular season record. The 49ers made it back to the NFC Championship game that season but lost to the eventual Super Bowl XLVIII Champions, the Seattle Seahawks. The 49ers were favorites to make another playoff run in the 2014 season and then the season happened. The 49ers finished with an 8-8 record and missed out on the playoffs for the first time since 2010. The decline of the 49ers increased as they lost head coach Jim Harbaugh back to the college ranks where he came from and key players like linebacker Patrick Willis and defensive end Justin Smith to retirement. Coach Harbaugh was replaced by former defensive line coach Jim Tomsula, who had only ever coached one game in the NFL. Defensive coordinator Vic Fangio also left and was replaced by Eric Mangini, former head coach of the New York Jets from 2006 to 2008 and the Cleveland Browns in 2009 and 2010. At offensive coordinator, Greg Roman left for the Buffalo Bills and Geep Chryst replaced him. Chryst was previously the quarterback coach in charge of Kaepernick. Offensive tackle Anthony Davis, guard Erik Pears, wide receiver Michael Crabtree and running back Frank Gore were among many players that left the organization during the off season for new squads. So, in terms of San Francisco’s early struggles, it’s not entirely Kaepernick’s fault. With a slew of new coaches and players, it’s clear that they are having a hard time adjusting so far. The 49ers last two games wiped away the great start they had against the Minnesota Vikings in Week 1 when they won 20-3. In Week 2 and 3, the 49ers’ defense allowed a total of 90 points for the first time since 1980. The 49ers also have the third-worst passing game in the NFL right now with an average of 172 yards per game. Kaepernick, the 49ers organization and their fans are hoping to get back on track and back to playing like the 2011-12 and 2012-13 49ers. Colin Kaepernick must make a comeback and take control of this team. If the Niners hope to turn their season around, Kap must command the offense and put numbers on the board, for his team’s (and fan base’s) sake.